I think it is safe to say that I, Kelsey, am now a Picking Master. The picker is one of the machines that I run most often and I have become quite a whiz at placing the fiber on the belt just so and conditioning it faster than I can say “sheep.” It has not been easy. I believe I have earned this title after defeating time and time again the one, the only Picker Room Monster. 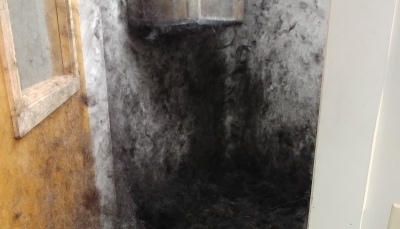 “Monster” may be too strong of a word (it is really just a bunch of fluff stuck to the walls and occasionally the ceiling) but I like to think of the fiber as a mystical, dangerous creature that could envelope the whole world in a nanosecond. It sure looks that way. However, the surprising thing is it doesn’t start out so badly. The picker machine seems to transform the most harmless of fibers into monsters. Take alpaca for example. It is one of the softest things I have ever touched. But, once the gorgeous locks are blown into the picker room, my satisfaction for having completed a bagful of the stuff turns to dread. The time has come to face the monster. I can see it through the window before I even open the door. It has crept up the walls and covered every inch of the room, dangling tauntingly from the ceiling. One part of me is afraid it will eat me alive. The other part of me can almost feel its smirk. It’s like an adorable yet mischievous kitten. She that knows she has done something wrong and looks at me with those precious eyes, daring me to get angry with her. Of course, because of her cuteness, I just can’t do it. I have no choice but to sigh and get on with it. I make her promise not to do it again. But I know she will anyway. Alas, the life of a Picker Master is tough. And so is the life of a Spinning Master, a Skein Master, and a Weaving Master. We all have our own menacing, mischievous monsters to conquer. But when those silky scarves and woolen mittens warm us up on freezing winter nights, all is forgiven.